This free, printable business plan helps business center franchises better provide shipping, rental and copy shop services to local sectors. The long-term goal of COMPANY NAME is to provide high quality shipping, mailbox rental and copy/print/fax services, to the residents of [CITY], [STATE] through a proven and well established [COMPANY] franchise. 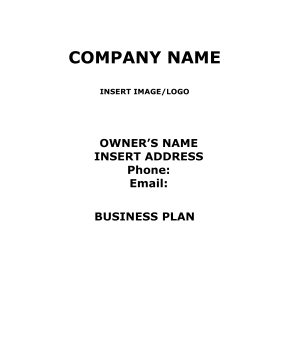 COMPANY NAME will acquire a franchise license from INSERT NAME in order to deliver these services. INSERT NAME has a long history of excellent customer service and through effective marketing and company policy adherence; it has become the No. 8 franchise in the USA. COMPANY NAME will be a start-up [COMPANY] shipping depot in a designated market area reserved by the [COMPANY] Corporation. COMPANY NAME became the dream of INSERT NAME several years ago. After retiring from [COMPANY] in New York City, INSERT NAME moved to [STATE] with his wife to enjoy his post-employment years. A few years went by and the INSERT NAME(s) began to search for a way to enjoy their retirement while still contributing to the workforce they have spent a combined 54 years enduring. INSERT NAME began seeking out an out of the box solution that would allow him to realize his goal. [COMPANY] was the answer, the #8 franchise in the country would provide the INSERT NAME(s) with a proven business and purchasing a franchise would eliminate the trials of a traditional start-up. INSERT NAME had been with [COMPANY] for 28 years and during the last six years he served as manager for a 3-4 million dollar budget. As manager he had up to 14 associates under him and honed his skills as a leader and financial expert. During his time as manager his departments' budget had never overspent. His wife, INSERT NAME also spent 25+ years with [COMPANY] and served as an information manager for field technicians. In this position she was responsible for disseminating pertinent information from the headquarters to agents in her service area. COMPANY NAME is headquartered in [CITY], [STATE], a picturesque city located in Southern [STATE]. COMPANY NAME is a shipping and mailbox depot concept that offers the highest quality services and a reputation to match. The Company's owners INSERT NAME(S) have established the necessary corporate structure to house the [COMPANY] franchise. The C Corporation, COMPANY NAME will operate under the [COMPANY] banner as a shipping, mailbox rental, and print/copy/fax services center in [CITY], [STATE]. The franchise guidelines dictate that the Company will have a predefined service area for itself, to ensure adequate clientele and potential revenue. The Company will lease the facility that will serve as the franchise location. COMPANY NAME will operate an [COMPANY] franchise and provide the usual list of services. These services include: providing shipping services and materials, mailbox rental as well as copy, fax and printing services. COMPANY NAME will focus on its designated market area in [CITY]. Franchise guidelines dictate that each franchisee have a specific area of market share. The formula has been set up to ensure that each location avoids direct competition from one another. Thus, COMPANY NAME has been given a slice of the [CITY] market to serve.